Do you have a list of places you want to visit? And plan diligently to strike off each one every summer? I somehow never had one, though Goa featured in the plans many times. Somehow we never seem to come around planning for this place. Though each time I hear about the trips Hubby dear seem to have undertaken, makes me think we must plan someday. All the expeditions he shared, are what you would expect from a boisterous bachelor group. Plus the comment if one doesn't indulge in spirits or partying, there is really no point in going places. Well I know we are more interested in what's cooked than anything else right! And so I ventured out, seeking what to make. Of course I knew for a while that I would be making these pavs from Goan. I have forever been waiting to make the Pavs, somehow, it never was the right time. After deciding on this theme, I had saved up this bread for Goa. Infact I was pestering Archana, to share what sort of bread they eat in Goa. She surely thought I had gone bonkers. Anyway after deciding on Poee, I wanted to make a gravy, and that's when I landed in Aparna's space. She so conveniently had this Goan Special called the Feijoada. In Goa, Feijoada is cooked with black eyed beans which is very easily available locally and comes in two versions, with and without pork. The addition of spices and coconut milk make the Goan Feijoada an absolute delight, creamy and full of flavour. Goa being a former Portuguese colony has a heavy influence by Portuguese cuisine. So it is an interesting fusion of typically non Indian dishes flavoured with Indian spices. It's also heavily non veg in nature. However, it's also something one can easily adapt to a vegetarian dish. Feijoada is one such dish and was so surprised to read that it's made with Black Eyed Pea. In Portugal, Feijoada is typically cooked with pork and the bean used depends on the part of Portugal where it is cooked and which beans is more commonly available there. So you will find the Portuguese also cooking Feijoada with white beans or kidney beans, and some versions include vegetables as well. 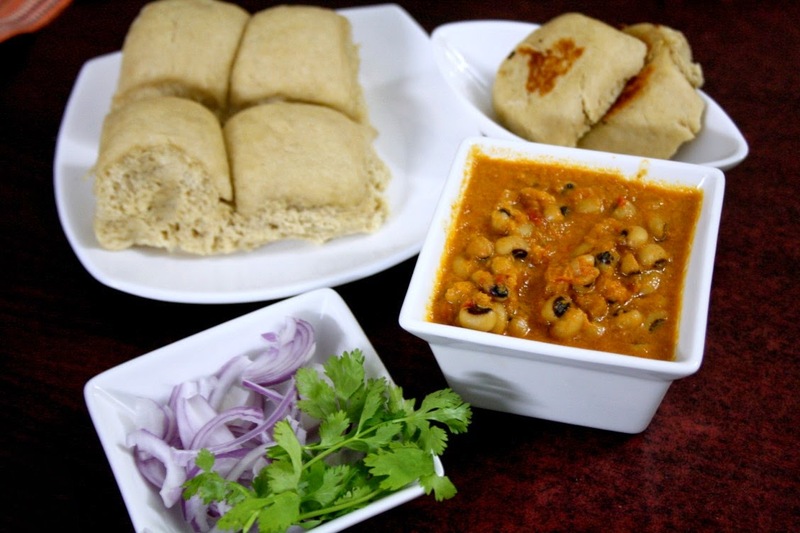 So really speaking, you could cook this dish with whatever dried beans you have in your pantry. And seeing these Alasanda being used, I was stumped to see it was exactly the way I make at home. Only saving grace being, somehow I am yet to share on the blog. So this gets on the blog as a Goan special! 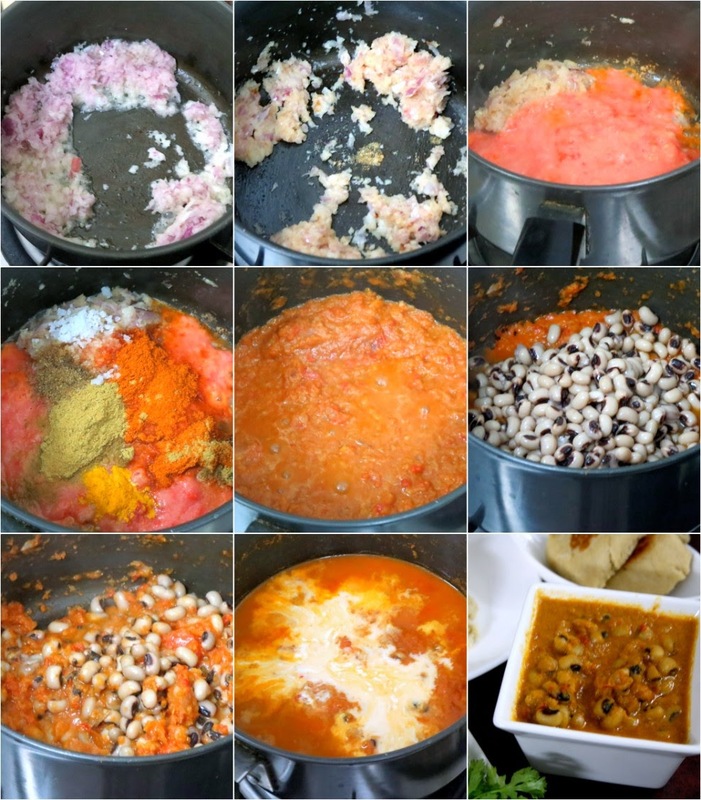 Imagine that..
Now I was again back on finding a recipe for Goan Poee, and read Raji's recipe. It was so wonderful reading about her memories. Though I never met her, we had exchanged many emails and I felt I always knew her. This is in memory of a lovely lady, and wish I had done a better job in making this dish. Somehow I forgot to shape the bread as how she had said and ended up making it regular way. And somehow the temperature in my oven wasn't right and the bread didn't brown properly. Since I didn't have any energy left, I simply had to make do with these pictures. Though I know there are couple of other friends who had used this recipe. So it surely works. Undo Pao: Soft square one. Pokshie: Round shaped with a slit in the middle and a crusty top. Katre: Same as above but with a different shape. Kankonn: A hard bangle shaped bread in the form of rings usually eaten dipped in black tea. Poie: Brown bread, round shaped and hollow inside. Good for diabetic patients & health conscious people. 15 minutes and reduced the temperature to 200 C and they turned out softer. MW water for 40 sec, add yeast and sugar. Keep it covered for 10 mins till it's foamy. 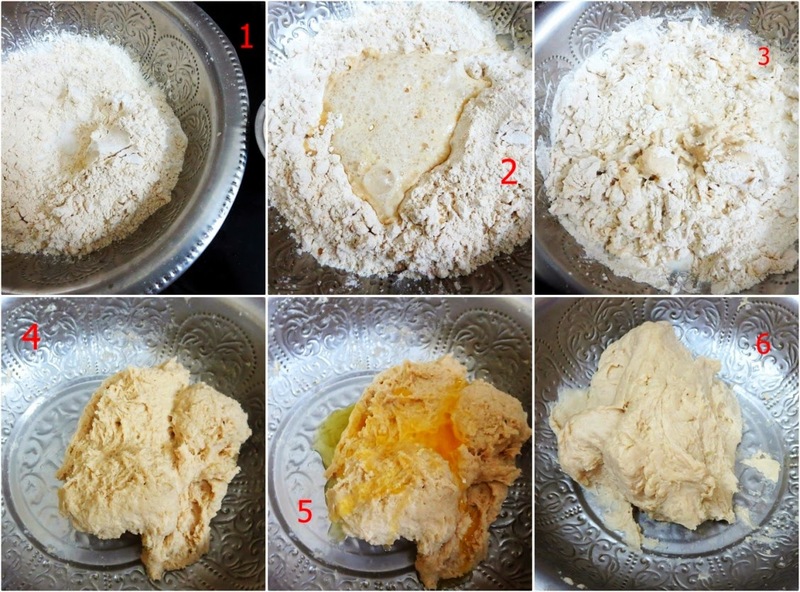 Combine the flour and salt in a big bowl, add the yeast mixture along with milk, water and mix well. Knead the dough till it is soft, adding a splash of water if it is too dry. If the dough is very wet, add some more flour and knead well. Continue kneading for about 5 minutes and then roll into a large ball, keep it covered in a bowl, in a warm place for about 1 and half hours till it doubles in size. 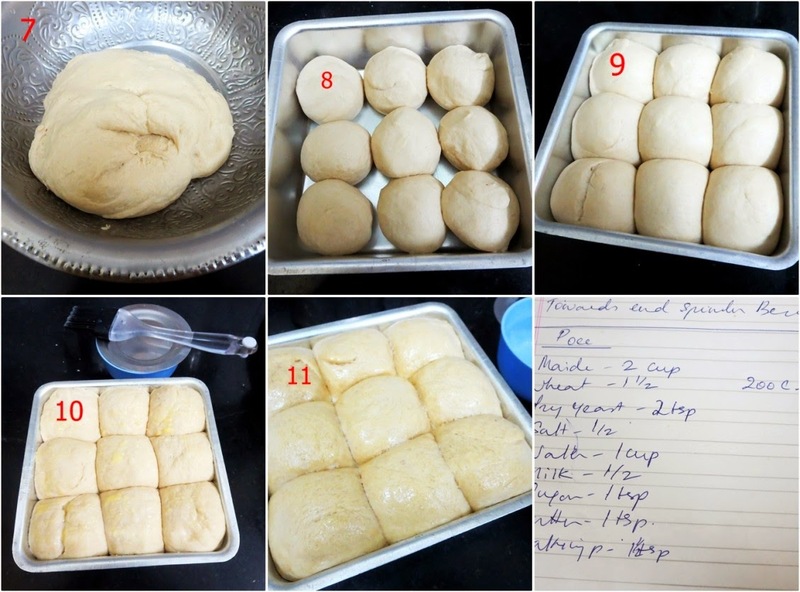 Knead the dough again and divide into 9 portions. I baked these as regular pavs, as I completely forgot about the slash over the top, though I remembered I was missing out something. For your reference, I am writing what Raji had mentioned in her post. Roll each portion into a round and flatten a bit, then make a vertical slash over the top in the centre with a sharp knife. With your fingers at the vertical slash, pull the dough apart gently from the centre to the sides. The ball will now look like an open book. Repeat with all the portions and place on a greased baking sheet and set aside in a warm place again till it rises – about half an hour to 45 minutes. Each portion will now look like a butterfly. Sprinkle a little flour on top of each and bake in a pre heated oven at 200-210 C for about 15-20 minutes. 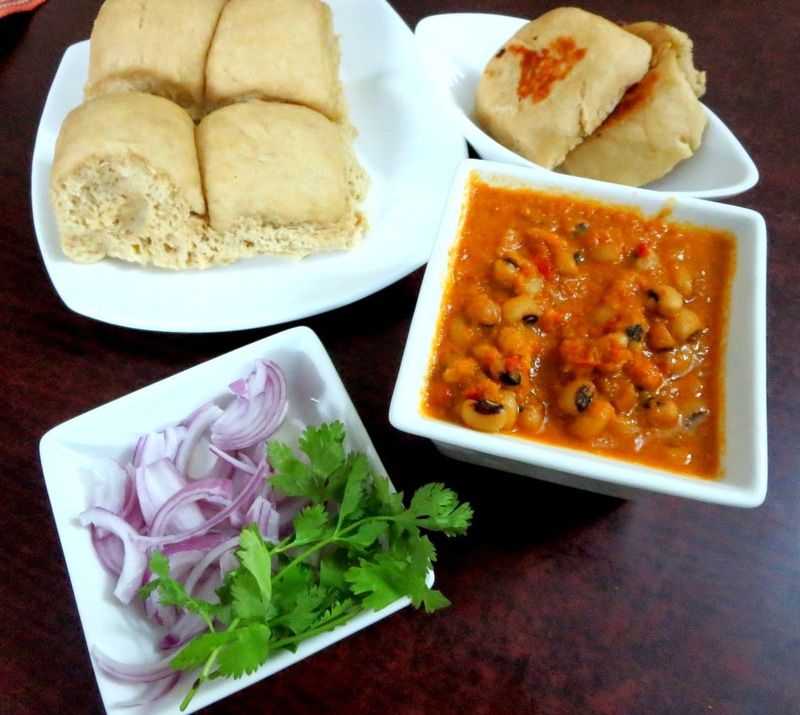 Serve as breakfast bread or as an accompaniment to a curry dish for a meal. Soak the black eyed beans for about 6 to 8 hours or overnight. Drain the water and pressure cook by adding twice it's volume or till its 2 inch above. Pressure cook and once done, keep it aside. Heat the oil in a non stick pan and sauté the onion till it turns golden brown. Turn down the heat to medium, and add the ginger and garlic paste and sauté for another couple of minutes till the raw smell disappears. Now add the spice powders and sauté for a couple of mins. Add the puréed tomatoes and cook till soft, about 3 to 4 minutes. Add the black eyed beans, the water and salt. Mix and bring to a boil, then turn down the heat so it simmers. Let the stew simmer for about 10 minutes. Black eyes peas usually works out best, if you roast them for 10 mins on hot kadai and then pressure cook. 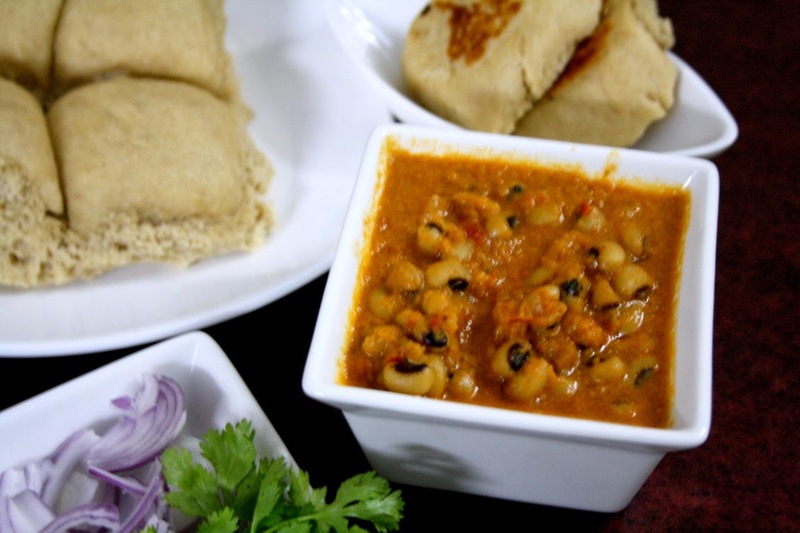 Unlike Channa, these gets cooked well if you forget to soak overnight.